Western blot analysis of extracts from COS-7 cells, λ-phosphatase or PDGF-treated, using Phospho-GSK-3α (Ser21) (36E9) Rabbit mAb (upper) or GSK-3α Antibody #9338 (lower). 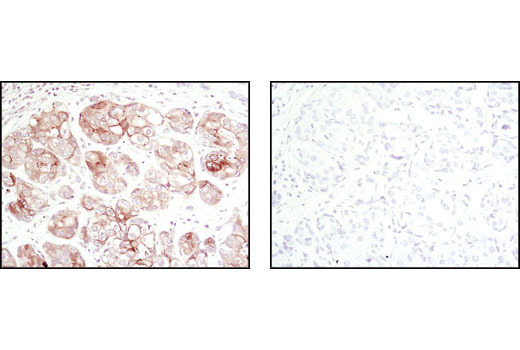 Immunohistochemical analysis of paraffin-embedded human breast carcinoma , untreated (left) or lambda phosphatase treated (right), using Phospho-GSK-3alpha (Ser 21) (36E9) Rabbit mAb. 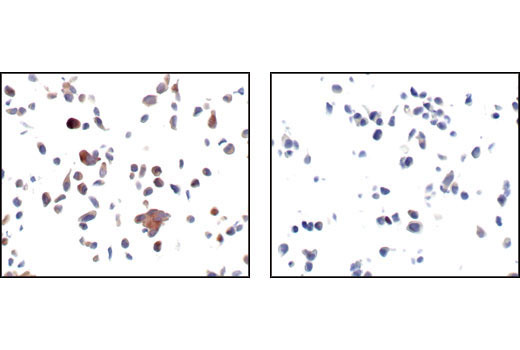 Immunohistochemical analysis of paraffin-embedded LNCaP cells, untreated (left) or LY294002-treated (right), using Phospho-GSK-3alpha (Ser 21) (36E9) Rabbit mAb. 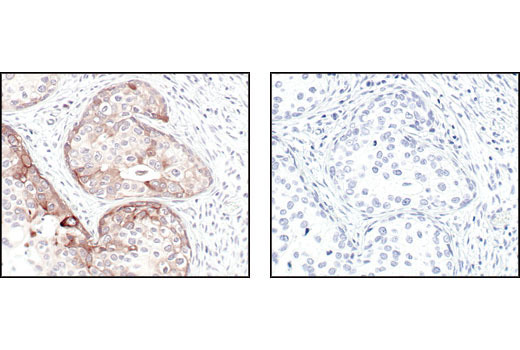 Immunohistochemical analysis of paraffin-embedded human breast carcinoma using Phospho-GSK-3α (Ser21) (36E9) Rabbit mAb in the presence of control peptide (left) or Phospho-GSK-3α (Ser21) (36E9) Blocking Peptide #1027 (right). 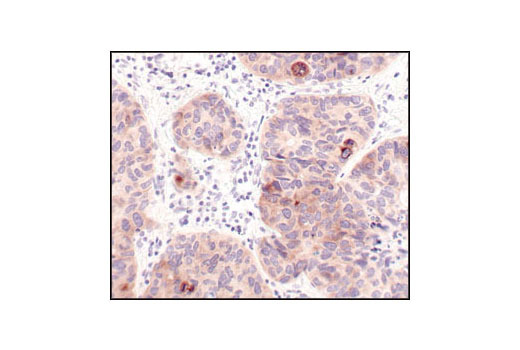 Immunohistochemical analysis of paraffin-embedded human lung carcinoma using Phospho-GSK-3alpha (Ser 21) (36E9) Rabbit mAb. 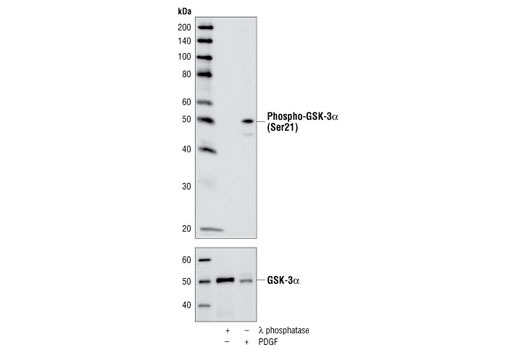 Phospho-GSK-3α (Ser21) (36E9) Rabbit mAb detects endogenous levels of GSK-3α when phosphorylated at Ser21 and does not detect GSK-3β when phosphorylated at Ser9. Monoclonal antibody is produced by immunizing animals with a synthetic phosphopeptide corresponding to residues around Ser21 of human GSK-3α.